Despite having leanings towards non-meat food and reducing the intake of animals, I occasionally have a hankering after a bit of lamb, and since we’re feeding 15 for lunch tomorrow, a big hunk of meat seems like the easiest way to go. In fact, considering the numbers, I’m doing three big hunks of meat. This is going to be a variant of Nigel Slater’s slow roast lamb, the main difference between my version and Nige’s is that I’ll cook it slower and longer, and maybe chuck in the odd root vegetable for ballast as it were. Heat your oven to about 90C. Maybe a little less, give 80C a go. Take down your pestle and mortar and grind up the salt, thyme, garlic, paprika and cumin along with a glug of oil so that it makes a rough paste. Set aside. Meanwhile get a large skillet really hot, smokin’. Sear the joint all over to give it a bit of colour, this may involve a lot of smoke, so if you have an extractor fan, crank it up. Oh yeah and don’t wear the clothes you’re going to entertain in, they’ll stink afterwards. Back in the kitchen again today, got a rush of blood to the head and decided on a curry. For curry, you need curry paste (which I’ve blogged about before) but this time I toasted the seeds before crushing them and fiddled with the proportions a little too. Toast the whole seeds gently for five minutes or so to release their aroma, making sure not to burn them. The kitchen will be filled with an amazing assault on your nose, although my youngest kid finds it a bit overpowering. It’s an indication of what’s to come though, because this paste imparts a great flavour and is something which develops with age. Grind the whole spices to a powder in a spice mill, or grinder. Transfer to a bowl and add the remaining spices. Add the wine vinegar and mix into a paste. Add about 5 tbsp water to the mixture to loosen it a bit. 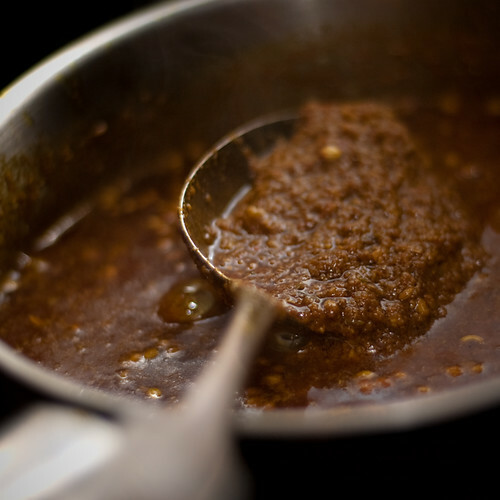 Heat the oil in a heavy frying pan, and stir fry the paste for about 10 minutes. Allow to cool a bit before putting it into airtight jars and then refrigerating. It should last three to four weeks in an airtight jar. In my search for the benefits of turmeric, I found this recipe for making a curry paste and decided I must try it! Turmeric can be used as an alternative to curry powder. It is the basis of a lot of Indian cooking, so it’s handy to have some in the fridge. This stuff is delicious, pungent, aromatic and can be heat-regulated by increasing or decreasing the amount of chilli powder or chillies. It keeps for a month in an airtight jar in the fridge. Grind the whole spices to a powder in a spice mill, or grinder. Transfer to a bowl and add the remaining spices. Add the wine vinegar and mix into a paste. Add about 5 tbsp water to the mixture tp loosen it a bit. Heat the oil in a heavy frying pan, and stir fry the paste for about 10 minutes. Allow to cool a bit before putting it into airtight jars and then refrigerating. I used a lot less oil than the prescribed cup. If the mixture looks a bit too dry after stir frying, you can always add a bit more later. If you want to make a curry powder instead of the paste, just follow the deviation above and don’t add any oil, water or vinegar. Turmeric tends to stain everything yellow, so don’t use anything too porous when you’re making it.